‘Episodes’, an exhibition of paintings by Varghese Kallathil, is straight from the heart. The present and the immediate have inspired him. Merciless construction, the plunder of natural resources, the potentially alarming future, globalisation have found acrylic expression on canvas. The exhibition, on at Nanappa Art Gallery concludes on September 23. The spectre of an alarming future, of what possibly awaits us if we don’t slow down are etched with frightening clarity and detail. And he does not claim to be an activist. “I don’t think a single voice can make a difference, but I do believe that many single voices could come together and become loud enough to be heard,” says Varghese. Excessive consumerism – of resources and of durables, the tendency to put a price or a price tag on everything worry Varghese. ‘Price Tag’, shows a shelf with busts of freedom fighters such as Gandhiji, Bhagat Singh, Nehru etc with price tags. And an empty slot… “waiting for the next head,” is a Che Guevara T-shirt which sits waiting with a price tag to be put on it. The painting is again inspired by a ‘real incident’. “Everything has been turned on its head, and now what next?” asks Varghese and his paintings too. This drawing teacher at a government school at Pallikunnu (Kannur district) says he worries about what he perceives as mindless development that is taking place all around. 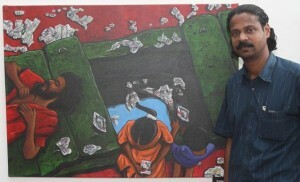 This is Varghese’s first solo exhibition. The exhibition was scheduled to be held at the Durbar Hall Art Gallery, but had to be moved because the gallery was shut and Varghese found out only after getting to the would-have-been venue. “Fortunately, Kaladharan master stepped in,” says a grateful Varghese. ‘Pray for Daily Meal’ has been inspired by the precarious condition of those living on the coastlines and derive their sustenance from it. ‘Slum’ is another nightmare vision of sorts, which Varghese feels is the future of most of our cities (unplanned development). Then there are some works that hark back to a kind of unadulterated past, with children playing, making paper boats. But the ominous signs of a troubled future are always there. Varghese has used colours rather eloquently. Each shade thoughtfully chosen and used for maximum impact, Varghese’s works are straight from the heart. “The water colour chalks I used for this sketch belonged to my father. They must be more than 150 years old,” says Thota Tharrani, standing thoughtfully before one of his works. His subject is very old too, some say as old as time itself — Ganesha, 51 depictions of the elephant god. Some of the paintings are suffused with light, and the tranquillity of ancient stone. Others are stark, imposing; another is caressed with the silkiness of turmeric paste. They range from stringent representations of the idol to an ephemeral, changing image seemingly willed into existence by faith alone. There is a Ganesha in powerful magenta and bronze, enormous eyes seeing all, the ears still, listening. So, colour weeps from the frames, snaking over the Ganeshas, in a moment captured from their daily ablutions. 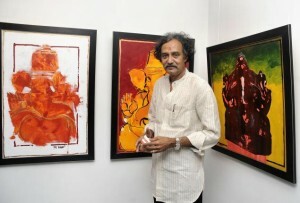 The paintings, in pen, watercolour, acrylic and oil, also mark the opening of the Focus Art Gallery in Alwarpet. Some of the works are characteristic of Thota’s minimalism, a few precious lines holding in a riotous orange, wine red or vermillion. Then, there are ones seemingly not held in such authority at all, only colour expanding into form — the whorls of his eyes, the majestic sweep of the ears, the potbelly that he wields with grace. Thota has also managed to remain fiercely independent. “Thirty-nine of the 46 exhibitions I’ve held in my life were funded, managed all on my own,” he says. “I welcome modern techniques to help in my work, but I am not dependent on them.” He points to a wall. “Four out of those five works have been screen-painted. Can you tell which one was done by hand?” the Padma Shri-winning artist asks, eyes twinkling. We pause, look, and then shake our heads. No, we can’t. And, there are none of your contemporary depictions of the elephant god playing cricket, or watching television. “No guitar-Ganeshas for me, thank you!” he laughs. This is the god as idea, as mathematical precision, as abstraction and power. The kind of god you would set amidst the vicious majesty of an unforgiving storm, an image stoic in strength amidst the relentless lashings of fate. You are currently browsing the Indian Art Blogs blog archives for September, 2010.